Today is Cambrai Day: the anniversary of the Battle of Cambrai in November 1917 when a force of more than 400 Mark IV Tanks broke the defences of the German Hindenburg Line and finally showed what tanks were capable of. Cambrai turned from a battle of great success to failure, but it heralded a new type of warfare and changed the nature of the battlefield forever. This photograph was taken after the conclusion of the battle in December 1917 at the railway marshalling yard at Cambrai. 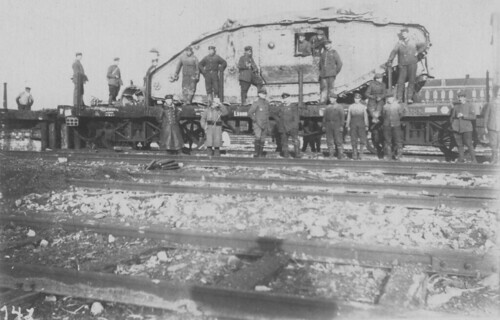 When the battle had turned to disaster for the British, a large number of Mark IV Tanks were captured and taken away by the Germans for analysis and eventual incorporation into their own tank force. Many of these tanks were used against the British in the German Offensives of the Spring of 1918, and against the French near Reims. At the time of Cambrai Britain’s tank force was known as the Tank Corps which later became the Royal Tank Regiment. On this Cambrai Day we recall their unofficial motto, inspired partially by the experience in 1917 and remember Tankies of all nations. From Mud, Through Blood to the Green Fields Beyond. This entry was posted on 20/11/2012 by sommecourt. It was filed under British Army, France, German Army, Great War, Hindenburg Line, Tanks, Western Front, WW1 and was tagged with 1917, Cambrai, Cambrai Day, German Army, Hindenburg Line, Tanks. My great great uncle was killed on the first day of the operations 20/11/1917 Private 14841 David Erasmus of A Company 2nd/4th Bn, KOYLI.